There has been a lot, and I mean A LOT of hype surrounding this series on bookstagram. 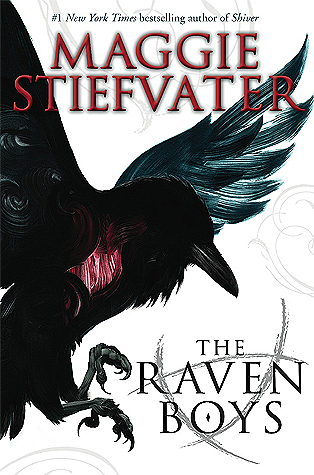 I love Maggie Stiefvater, so I thought picking up this series would be a good idea. I started listening to the audiobook and was intrigued by the story, but it moved a little slow and I was pretty darn bored to start off. The characters were a major plus in the story. Blue is adorable and outgoing, and all of the boys are daring with large, fun personalities. I have to say that Gansey really made the book for me. He's good looking (at least how I picture him... insert cat heart eye emoji here please), he's tough, he's smart, and he is going after what he wants. The other characters were fun, but I don't feel like I connected to them as much. The story line is pretty interesting, but I felt like it was intentionally drawn out and long in order to release 3 other books in the series. I've been told by other readers that the first book is the slowest, and the others pick up a good bit so I think I will still give them a try. I'm glad I had some encouragement because otherwise I'm not sure I would have continued. The writing is good but rather jumpy, and it was even somewhat confusing at times. I felt that some information was given in too much detail and some without enough details. In summary, it was a decent start to a series although I'm not completely hooked. I would suggest a friend to pick it up, but it definitely wouldn't be something I'm screaming about from the rooftops. I'll continue with the series even though I'm not really dying to know what happens next.